On July 14, 2017, an exclusive press conference and weigh in was located at “The Sphinx on K,” 1315 K Street NW, Washington, DC 20005 at 12:00 pm on the lower level. 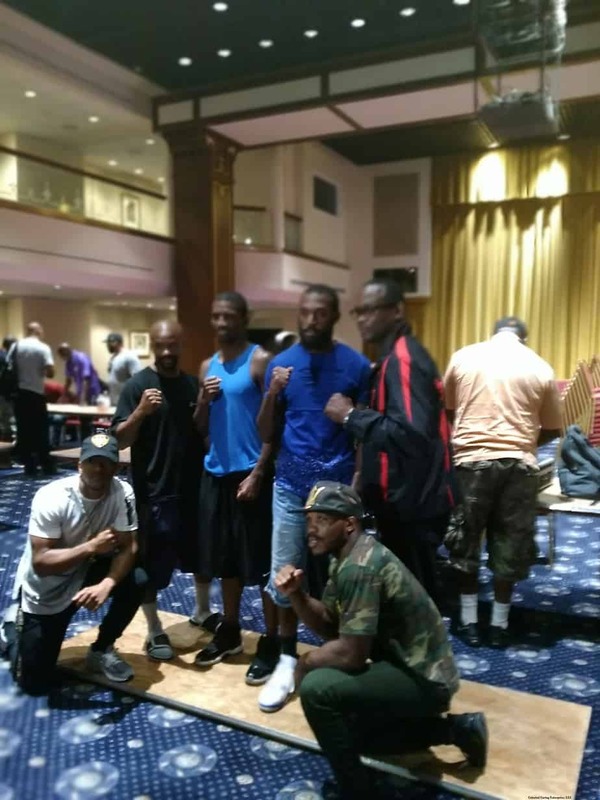 This event was “The Quest for Another Title” that was held the night before the main event, “The Return of Gerome (GQ) Quigley” Boxing Championship Part Two” event presented by GQ Promotions. Dante Cox from Laurel MD weight was 133.8 vs. Archie Weah from Norcross, GA weight was 135. Rashad Kilpatrick from Oxon Hill, MD weight was 145.2 vs. Martegus Martin from Columbus OH weight was 142.2. Leo Alcanera from Fort Washington, MD weight was 165.8 vs. George Sheppard from Newport News, VA weight was 166.5. Justin Bell from District Heights, MD weight was 175 vs. Erik Plumeri from Lockport, NY weight was 170.4. Francisco Bustos from Rockville, MD weight was 159.6 vs. Latrail Purdue from Huntington, TN weight was 160. Jahmal Dyer from Baltimore, MD weight was 135.6 vs. Lawrence Martin from Akron, OH weight was 160. Jason Bell from District Heights, MD weight was 176.6 vs. Dameron Kirby weight was 168. Luther “Lights Out” Smith from Bowie, MD weight was 199.4 vs. Martez Williamson from Akron, OH weight was 191. Sam “Vanilla Gorilla” Crossed from Greenbelt, MD weight was 196.8 vs. James Jones from Nashville, TN weight was 198.8. Gerome “GQ” Quigley Jr. from Germantown, MD weight was 149 vs. Luis “La Roca” Hernandez from Puerto Rico weight was 149.2. As you can see there was a huge weight gap between boxers Jahmal Dyer and Lawrence Martin. Also, between Jason Bell and Dameron Kirby there was a gap, but not too bad of one. However, the weight distance was on the borderline. Overall the press conference and weigh in was a smooth process handled by GQ Promotions. All of the boxers were very pumped up for the fight that was to happen the very next day at the same location.